Welcome to Murga Boot Company! Chocolate Brown Collection- Polished Stingray, American Alligator, Polished Stingray, Roughouts(Suede). 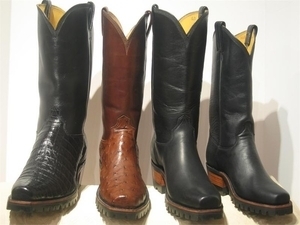 Custom Motorcycle Boots as shown: American Alligator, Ostritch, Mulehide/Calf Boots with Vibrum Soles.